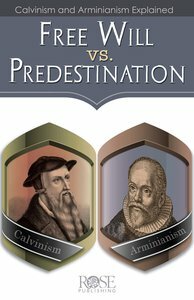 This popular Freewill vs. Predestination Pamphlet compares the beliefs of Calvinism and Arminianism on 5 key topics. This Calvinism and Arminianism comparison chart is helpful for personal use, adult Bible study, Sunday school lessons, and homeschool curriculum. What's at Stake in the Calvinism vs. Arminianism Debate? The two views have many practical implications. Do people have free will or does God predestine them to be saved? If God elects us, is there any reason to spread the Gospel? Can a person lose his salvation? This easy-to-understand pamphlet compares the teachings of Arminianism with Calvinism and gives the key Bible verses you need to understand this important topic.
. Glossary of words: Arminian Points, Prevenient Grace, Regeneration, Remonstrance, Saints, Synod, and TULIP. About "Free Will Vs. Predestination (Rose Guide Series)"